ਨੈਸ਼ਨਲ ਪੈਲੇਸ ਮਿਊਜ਼ੀਅਮ ਦੇ ਉੱਤਰੀ ਸ਼ਾਖਾ ਦਾ ਮੁੱਖ ਹਾਲ. The Dwelling in the Fuchun Mountains, by Huang Gongwang, 1347-50. ↑ 國立故宮博物院: 106年度參觀人數統計 (PDF). National Palace Museum. Retrieved 23 March 2018. ↑ Distinguished from the Palace Museum in Beijing. 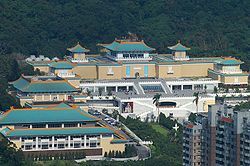 In common usage in Chinese, known as the "Taipei Former Palace" (臺北故宮), while the Palace Museum is known as the "Beijing Former Palace" (北京故宮). ↑ Peter Enav (12 May 2009). "National art collection evokes hard history". The China Post. AP. Retrieved 16 June 2012. ↑ "Zhishan Garden - Introduction". National Palace Museum. Retrieved 17 June 2012. ↑ "Chang Dai-chien Residence". National Palace Museum. Retrieved 16 June 2012. ↑ "The National Palace Museum Annual Report 2011" (PDF). National Palace Museum. Retrieved 16 June 2012.